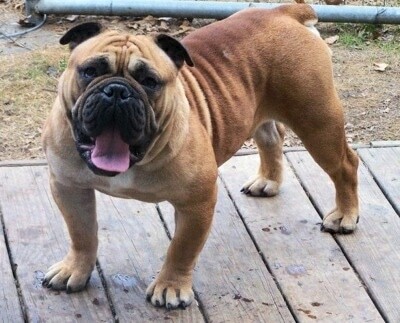 The Amitola Bulldog should resemble the more heavy duty English bulldog, without the problems plaguing the larger more brachycephalic dogs. The shape of the Amitola is one of equal proportions so the shoulder width is equal to that of the hips. The Amitola is never restricted from any color or combination of patterns. In the foundation breedings various Bulldog breeds were used to infuse the colors once removed from Bulldogs. 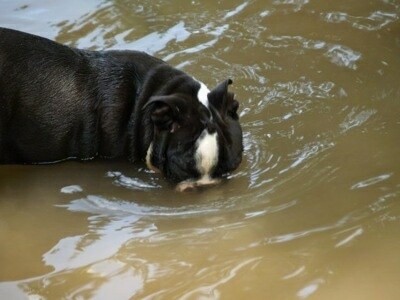 Any and all colors known to dogs can appear in the litters. There are no points for color; it has no bearing on quality of the dog, nor the health. Base color: black, blue, chocolate, lilac, isabella, cream, red and fawn. Any patterns including but not limited to: self, sable, w/tan, brindle, piebald, spotted and merle (and any new variations). (Grace given to young pups during development of color pigment until 6 months of age without penalty.) The head is massive, full of wrinkles but not so much as to cause detriment to the dog’s physical being. Top skull to be broad, with a nose break that can be felt even if not seen due to heavy padding on muzzle. Ears to be small; rose or drop ear and lay close to the head. Ears brought forward when dog is alert. For perfect ear set the ear should begin on an invisible line up from the outside corner of the dog’s eyes when in repose (relaxed). Nose to be set just below lower lid of eye, not even with them. The muzzle to be padded both above he nose and on the sides, a nose rope is allowed, however it should not be so large as to effect vision or visualizing the entire nose. When seen from the side, nose and lower jaw should appear turned up at an approximately 45° angle away from the top skull. Lower jaw to be undershot, lower front canines should not protrude when mouth is closed. Nose to be medium to large size, with wide open nostrils and fully colored (this can be overlooked in puppies under 6 months of age). It should point straight ahead of the dog’s face and not be turned up on an angle. Eyes to be round or almond shaped, not narrow or bulging. (This is not a Mastiff head.) The dog should be fit enough to maintain a normal body temperature during a dog show and various activities. Clean, easy breathing is essential. The chest and ribs are broad, wide and rounded, but not so broad as to give the dog a flat chested appearance in repose. Not so rounded as to cause poor movement in the forearms. Ribs are well sprung, blending into good tuck up of abdomen. There should be a smooth flow from top of head; back to tail. There can be a slight dip behind the shoulder blade at the withers; a level back is preferred. The front legs are to be medium to large boned and straight from elbow to foot. Well defined muscles from neck to shoulder fully muscled to mid-section of leg. Dog should be able to free stack with forelegs in proper straight down beside the chest positions. Elbows to be placed straight down from withers beside the chest wall, not in front. You should see more chest in front of forelegs when viewed from the side. Feet to be large and up off pasterns. Feet to resemble a cat's, not flat or splayed. (You should not see any flat area from the top of the foot.) Hips should be as wide as front of dog. There should be a gentle slope leading to tail base. When viewed from behind, rear legs should come straight down from the hip, muscular, causing the feet of rear legs to be directly in line with front legs. Rear legs to be angulated at a 90-degree angle, perpendicular to the ground, and well-muscled. Equal density of bone and mass as the front of the dog. The tail is thick and full, may be wrinkled (preferred) and should come to a tapered end. The Amitola Bulldog should move with a purposeful stride, not lumbering or sluggish. Bone and weight should be balanced allowing dog to carry weight easily. The front and rear legs should move in a straight line without toeing in or out. The Amitola is bred to be moderately wrinkled, have plenty of mass but have an athleticism making it capable of normal activities, swimming, weight pull, surviving the extreme heat in the South and other parts of the country. They are not bred for protection, although they are loyal and loving. They do have a natural guarding ability. The Amitola thrives on being part of the family. They adore their owners, and love people but yet still have the tenacious nature of the Bulldog. They need leadership and respond well to training. This dog is being created to serve as an all-around companion animal. Bred to be calm and watchful, yet with strength and stamina to work, when and if desired by the owner, the Amitola should be able to do agility work as well as weight pulling. It should be intelligent and eager to learn. There should be no timidity or aggression toward man or animal. Comes in three size varieties. Amitola Bulldog females are loving, devoted mothers with free whelping and normal functional bodies. There is always the chance for an emergency to occur, however C-sections are not to be considered normal. They should be rare and almost unheard of. The shape of the Amitola is one of equal proportions so the shoulder width is equal to that of the hips, allowing the birth of the Bulldog babies; heads. 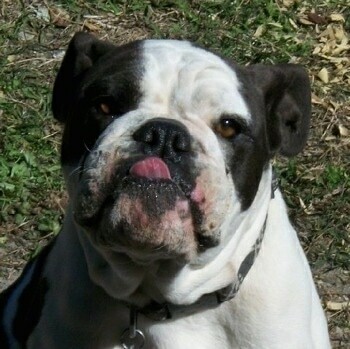 The Amitola males, like most Bulldogs, have no problems wanting to breed. 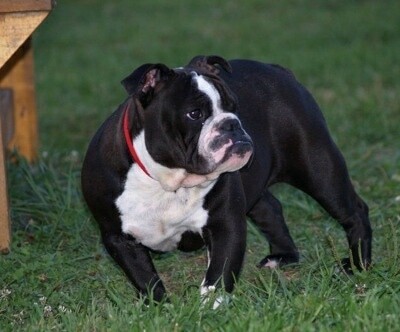 Stamina and structure made breeding next to impossible with most English Bulldogs. The Amitolas are in great physical condition, not too heavy for the female and also toned enough for stamina in breeding. Will do okay in an apartment if it is sufficiently exercised. They are relatively inactive indoors and will do best with at least an average-sized yard. The Amitola Bulldog needs to be taken for a long daily walk. The Amitola Bulldog is a new breed of bulldog. The word "Amitola” means rainbow in Native American culture. When looking to find a unique name to call their creation founders Candi Fortney and Lisa Allen both came up with the name. The name represents the wide variety of colors the dog comes in. 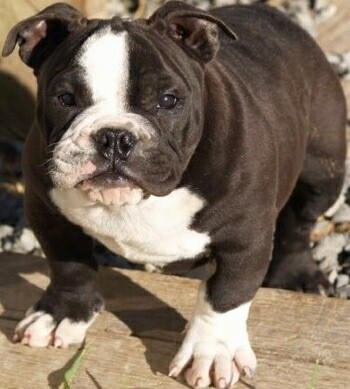 Lovebug is a black and white female shown here as a puppy; she is a miniature variety Amitola Bulldog who resides at Wallers Freedom Kennels. Lovebug the Amitola Bulldog at 8 months old—"This breed is not high energy, but can maintain a steady pace should the owner lead a more athletic lifestyle. 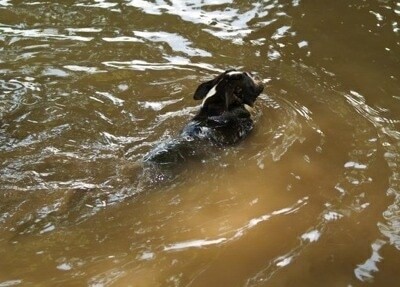 They even love swimming."